The panic at absurd rumors of Facebook’s demise over the weekend, coupled with the Goldman Sachs Facebook investment frenzy at the beginning of this year got us thinking; Did initial Facebook investor Peter Thiel, who invested 500K early on and still thought Facebook was undervalued at $30 billion back in September, actually make the most impressive investment call in tech history? 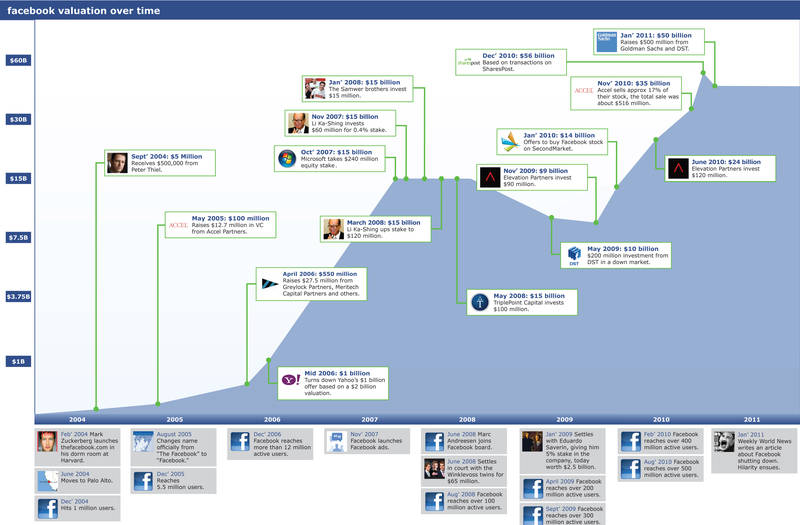 So artist Audrey Fukuman, our rockstar intern Rip Empson and I set out to capture what the Facebook valuation trajectory looked like. And while trudging through all the speculation on this has raised some discrepancies concerning exact valuations, (I’m seeing anything from $4.9 million to $5 million for the Thiel financing but rounded up for consistency’s sake) I did my best to capture the zeitgeist through consensus, leaning heavily on reports on TechCrunch through the ages. And there were a lot of them, I think we did about three posts dealing with the Elevation Partners investment alone. 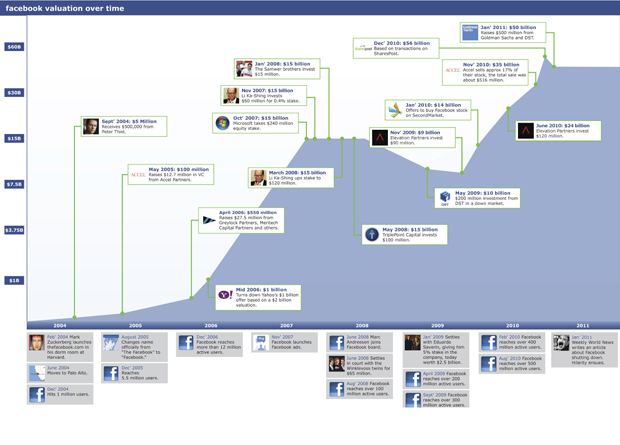 In researching this I also borrowed heavily from the official Facebook timeline, Crunchbase, The Harvard Crimson, Vator.tv, the WSJ, the NYT, countless TechCrunch posts as well as Adam Rifkin’s answer to the “How did Mark Zuckerberg retain 26% of equity after so many rounds of financing?” question on Quora. Hey Facebook, you’ve come a long way baby.